The plastics scientist talks about the process behind his work in polymers and what the future holds for inventors. 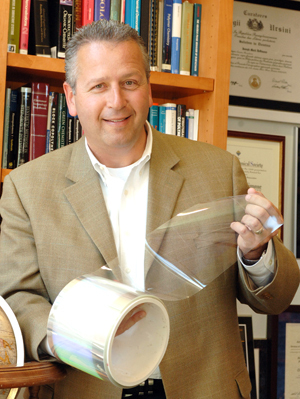 Joseph DeSimone is a chemist, an inventor and a man with vision into the future. He holds more than 115 patents. One of his first involved a green approach to making high-tech polymers–plastics like Teflon and Gore-Tex–without the use of hazardous solvents. DeSimone spoke of his work, about what it’s like to invent things and about what he sees as the role of science in this century, with EarthSky’s Jorge Salazar. We work at the interface of a lot of different things. And I think at one level we’re problem solvers. At another level we’re entrepreneurs. I don’t know exactly how to describe it any more or less accurately than that. We make things. That’s one of the reasons why I like polymer science. At the end of the day you actually have something. Tell us about your upbringing. What sort of upbringing fosters an inventor? My parents are terrific people. My father is a tailor born in Italy, and my mother is an accountant. We had constant encouragement and strong schooling, and we had active participation in science fairs and the like. My father was very meticulous and inquisitive, and certainly showed us leadership through example. And that was a great environment. In high school, I fell in love with biology and chemistry classes. I remember one day in particular, the teacher in high school explaining pH acidity and base acidity. And I remember thinking, you know, I have absolutely no idea what he just said. I don’t think he really knew what he’d just said. So I went home that night and read up. I taught myself about pH and came in the next day. As the class topic continued that next day I remember basically explaining to the classroom all about pH. And everybody got it, including him I think. And I knew then I had a knack for not only understanding, but also explaining. Tell us about one of your first breakthroughs, a greener way to make Teflon. So we started working with polymers, using supercritical fluids. That became the foundation for how I launched my career. I’m a firm believer that, as the business people will say, strategy is all about being different. Some of the most fertile ground for innovation lies between fields. For example — putting polymer synthesis together with supercritical fluids. Recognizing that it would be a green manufacturing process, if in fact we could make polymers in CO2. Through a partnership with DuPont, we did that. We began making Teflon in CO2. We pioneered that. It was perceived to be valuable, especially because DuPont was being hammered because of the environmentally unfriendly way Teflon was made at the time. The new method–using CO2–became a much more environmentally preferable way to make Teflon. So, that really launched us into a good run of 15 years or so, working in CO2 and doing a lot of different polymer chemistry in it. Sounds like it was something radical. It was very different. To run a chemical reaction in compressed carbon dioxide required new equipment, new ways of doing reactions. We had to invent new reaction vessels. We had to invent a lot of equipment and instrumentation. I’m really intrigued by that. I like doing those things. I think it starts bridging more towards chemical engineering at that point. In a sense bringing the leading edge of science to engineering. Yes, and vice versa. These are two-way streets if you pride yourself on being state-of-the-art in basic science. A lot of people believe that developments in basic science lead to new technologies. And that’s certainly true. But often new technologies open up entirely new horizons in basic science. Tell us more about your work now. We hear you’re making incredibly small and precise templates to deliver new medicines inside the body. At Virginia Tech, I was exposed to a technology called lithography. Lithography is the basis by which polymers are used to make patterns on silicon wafers–to make circuits, transistors. Lithography is the backbone of the semiconductor industry. What we’re doing now is harnessing the manufacturing techniques of the computer industry–basically lithography–and applying those techniques to making new vaccines in medicine. We’re basically making particles — delivery vehicles — that are extremely uniform. They have all the precision and uniformity of transistors. We have a platform we call PRINT: Particle Replication In Non-wetting Templates. It’s a particle-molding technology, with the patterns made using lithography. We use it to make particles with controlled size and shape. Then we bring our chemical acumen and capabilities to design new chemistry such that we can make particles that are highly functional. They do things that we want them to do — for example, deliver nucleic acids, deliver chemotherapy agents, seek out certain types of cells versus other cells. So, we’re using these details of size, shape, chemistry and elasticity to enhance the performance of vaccines in medicine. With our technology, we’re trying to recapitulate what one had with the early vaccines, which were very efficient, but eliminate the safety problems. We have a really exciting program for doing this. We spun off a company called Liquidia Technologies. What’s really cool is I had a chance to speak with Bill Gates about our work over a year ago, and it was a neat experience. I knew I was going to have about 10 seconds of his time and an introduction. You know the obligatory question, what do you do? I told him that we’re using the manufacturing tools of the computer industry to make new vaccines and therapeutics. Ultimately, that meeting culminated in the first-ever equity investment by the Bill and Melinda Gates Foundation in a for-profit biotech company: our company, Liquidia Technologies. Liquidia and my academic lab here at the university are both pursuing this idea of sizes and shapes and chemistries for making new vaccines and new medicines of different types. This gets back to what you were talking about earlier, about being able to explain your work to people outside of science. Absolutely right. Because, as we like to say, vision without resources is just a hallucination. And if you can’t articulate that vision, those resources don’t flow. We have a lot of problems in society. To me, that’s an immense opportunity for furthering what it is we do in science and engineering. The National Science Foundation and its mission in basic science — developing new concepts and new understanding–is the foundation with which applications emerge. That’s whether it’s NIH [National Institutes of Heath] or the Department of Energy or the Department of Defense. We as a community are fortunate to be able to access federal funds to do what it is we do. Now, I think, part of this new social contract that we’re all staring at regarding budget challenges is going to be a commitment to continue to foster the basics, which is really important. But also to be able to take those basic understandings and apply them to solving society’s biggest problems. Is that why you think university scientists need to work more closely with industry? Yes. It’s awfully comfortable in a laboratory setting. But actually going out and applying one’s craft, if you will, to solving problems is something I think is important. Not everybody has to do it. Not everybody should do it. But those that do it ought to be embraced like those that don’t do it. Publishing papers is hard, and peer review is tough, as it should be. But, getting one’s science financed in a start-up, for example, or having industry buy into it — that’s like peer review on steroids. People may be betting their own dollars on your idea. The intense scrutiny that it puts on one’s science, and on convincing people, makes science stronger. I find the venture capital community very rigorous. They bring academics, Nobel laureates, to bear on evaluating what one does. So being and working entrepreneurially makes our science better. It tells us where the problems are. I think scientists are going to be under increasing scrutiny going forward, as we should be. And I just reiterate that we as a society have a lot of problems, which are really opportunities. To be proactive in solving problems in ways that grow the economy, create jobs and improve the well-being of society–that’s a great opportunity. Listen to the 90-second and 8-minute podcasts of EarthSky’s interview with Dr. Joseph DeSimone (see top of page). For this and other free science interview podcasts, visit the subscribe page at EarthSky.org. 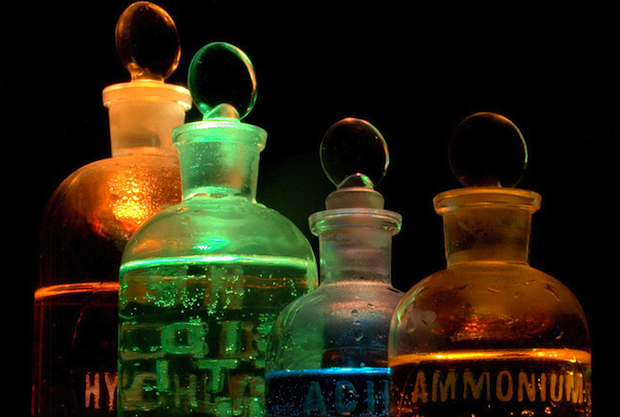 This podcast is part of the Thanks To Chemistry series, produced in cooperation with the Chemical Heritage Foundation. EarthSky is a clear voice for science.